Big News! I'm a pretty girl again! Wohoo! 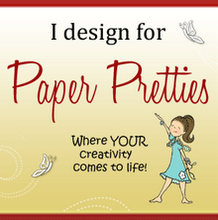 I'm very excited to be working with Paper Pretties again, I hope you'll enjoy my Paper Pretties creations. For this week's challenge we're asking you to use brads. That's pretty easy, I know you can do that so after you've finished your card pop over to the Paper Pretties challenge blog and link it up. Who knows, you could be the winner of some digi images like this cutie pie Birthday Bird. There are two new digi images being released today. This one is "Happy Bird-day" by Fawn Palmer. Very cute, don't you think. I had to have it. First of all it goes perfectly with this paper and secondly I have a couple friends who say "Happy Birdie" (I'm not the only one that's easily amused). I know the Paper Pretties fans love ARTish digis so don't worry there's an ARTish image there too. paper - My Favorite Things "Sno-Cone" and "Kraft" card stock; Recollections "Watercolor, Cherry Blossom" and "Itsy Bitsy Ditsy Cherry Pie"
Thanks for stopping by, come back again. Chirs, your card is beautiful! So happy to have you on the team! I love the soft colors you chose...so delicate like a little dogwood tree. Hi Chris, glad your on the PP DT. I love your card and the papers you used. I love being on this DT. Lovely colors and image. 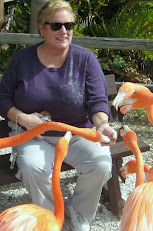 I am very glad you entered this week at Tuesday Throwdown. I hope you had fun!!! See you back very soon to play in another fun challenge. Love your card. Welcome back to Paper Pretties DT. Excited to be working with you! awesome news! congrats on making another fun dt- always love to see more of your fab creations! 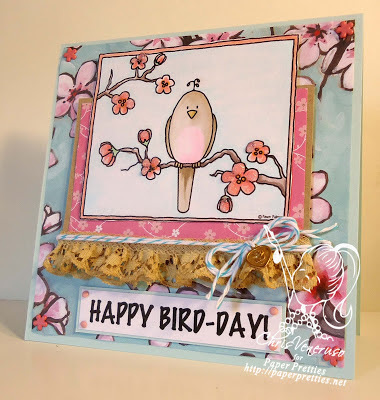 i LOVE this card- the colors, the papers the adorable bird with the blossoms- super cute! Fabulous card LOVE the sentiment and great image and lace! Gorgeous card. I love the birdie and those beautiful floral papers. I like to laugh but I cry easily. June 15, 2010 - Can You Dig it? My card Buttons and Bows was one of seven winners in the MOJO98 Challenge. That's pretty exciting news because there were over 500 cards entered. If you'd like to see it click here. One of my cards is included in the slide show in an article on "Examiner.com. " You can see it by clicking here. When you get there scroll down and click to watch the slideshow. My card is number 8. Are You Crazy for Challenges?